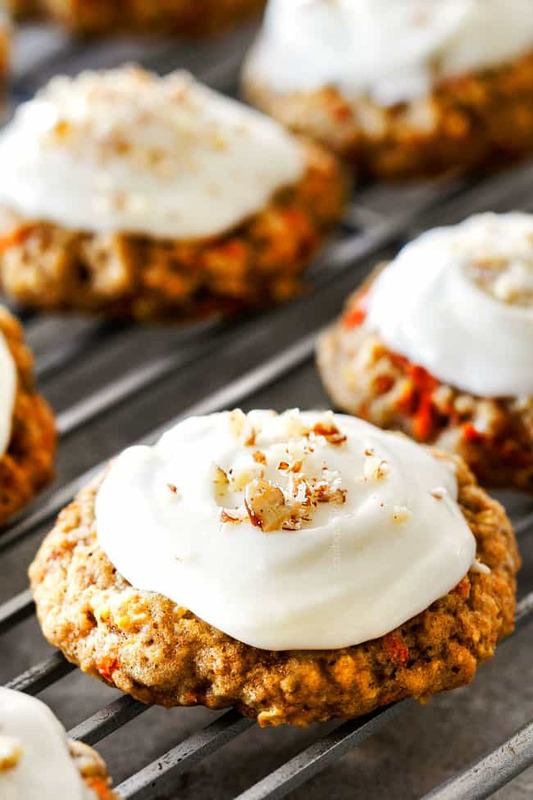 Soft and chewy Carrot Cake Cookies smothered in silky Cream Cheese Frosting for individual bites of carrot cake bliss! These Carrot Cake Cookies are perfectly portable, perfectly tender, and perfectly melt-in-your-mouth addicting. They encapsulate everything you love about Carrot Cake with its aromatic fragrant spices, carrots and pecans rolled into easy-to-make chewy cookie form. And of course, Carrot Cake wouldn’t be Carrot Cake without tangy, rich and luscious Cream Cheese Frosting. Today is officially the first day of spring which means it’s time for everything carrot cake! 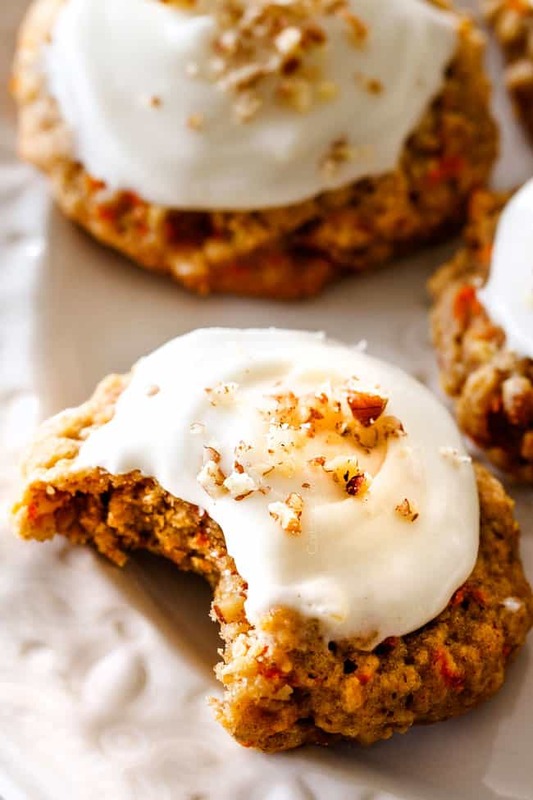 Carrot Cake is definitely a spring dessert I look forward to all year round; so much so that I’ve already made Layered Carrot Cake, Cream Cheese Stuffed Carrot Cake, Carrot Cake Crepes, and now these Carrot Cake Cookies! 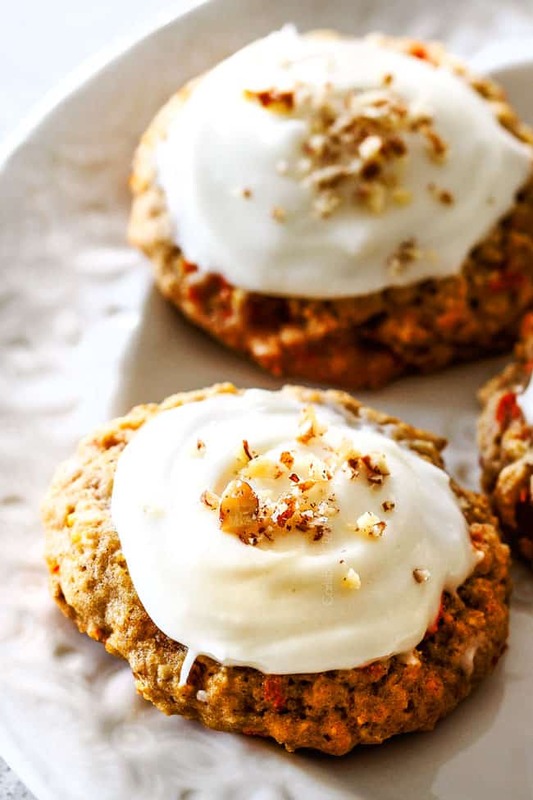 These irresistible Carrot Cake Cookies got an “oh wow” from Patrick. Who proceeded to devour 1, 2, 3,… and I had to send them to work with him because I have no self control when it comes to these cake-like morsels…and neither did his colleagues. 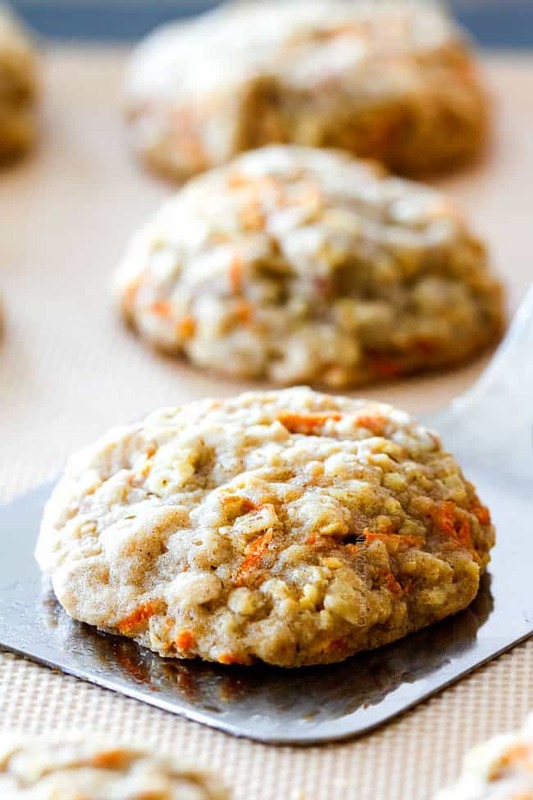 These easy Carrot Cake Cookies are tender and soft from the carrots and wonderfully chewy from the oatmeal. They are bursting with just the right amount of sweet aromatic spices. 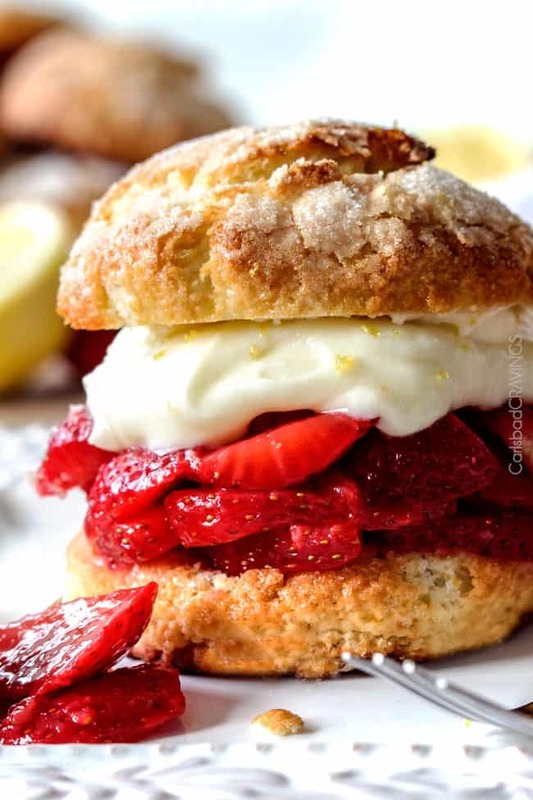 They are delicious on their own but exponentially more delicious with the Cream Cheese Frosting as the juxtaposition of the hearty cookies with the silky, sweet frosting is nothing short of divine – so please don’t skip it! Let butter soften at room temperature TO room temperature. As in all cookies (unless they call for melted butter) never microwave your butter or your cookies will spread too much when baked. The butter should be slightly softened at room temperature and will soften as needed while you beat it. Use the small holes on a box grater to grate the carrots. Do NOT use pre-grated matchstick carrots. These carrot are too thick for our cookies and don’t release moisture like freshly grated carrots. Use quick oats or make your own. Old-fashioned whole rolled oats will not work in this recipe, but that’s usually what I always have on hand. You can make you own quick oats by pulsing whole oats in your food processor 5-8 times or until they resemble the consistency of quick oats. Use a cookie scoop. This makes your life easier and ensures the cookies are all the same size and bake in the same amount of time. I used a 1 1/2″ or 1 1/2 tablespoon cookie scoop. If you have a different size, that is totally fine, just adjust baking time accordingly. Bake the cookies on parchment lined baking sheets or use a non-stick mats. Your cookies will definitely stick otherwise and parchment/non-sick mats make for easy cleanup. Flatten Cookies. These cookies won’t flatten very much when baked (unless your butter is too soft), so give them a little help and press down a little with your fingers to help flatten. Bake cookies just until edges are golden. The key to soft, chewy cookies is to not overbake them. Take care to remove the cookies from the oven when the edges are slightly golden and the center is set but slightly underdone. They will continue to bake to perfection as they cool. Do NOT microwave butter or cream cheese for Cream Cheese Frosting. Let butter and cream cheese soften at room temperature or it will be too runny. If it is runny for whatever reason, place it in the refrigerator to set a bit. Can I Freeze Carrot Cake Cookies? Yes! You can freeze frosted or unfrosted Carrot Cake Cookies. Place frosted or unfrosted completely cooled cookies on a baking sheet without touching. Place baking sheet in the freezer and freeze cookies until solid. Wrap each cookie individually in plastic wrap and add to a freezer bag and seal. When ready to eat, remove desired amount of cookies from freezer bag then remove from plastic wrap so condensation doesn’t form. 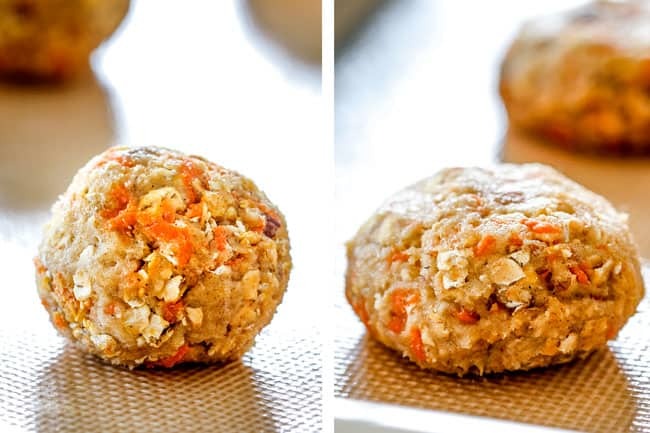 Let Carrot Cake Cookies thaw on the counter for 15-20 minutes. Happy spring, Happy Easter and Happy Carrot Cake Cookie eating! 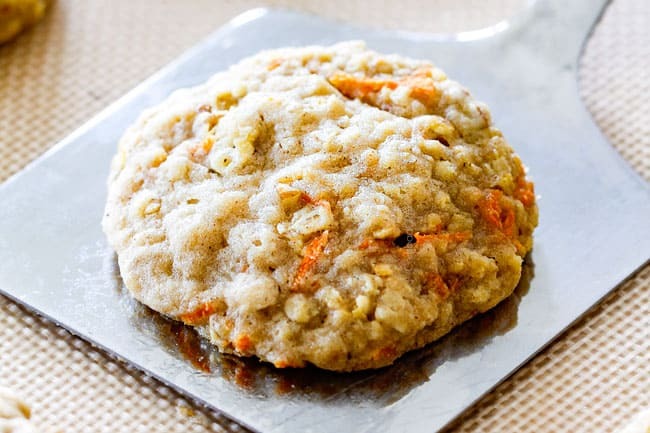 Want to try this Carrot Cake Cookies Recipe? Pin it to your COOKIES, DESSERT, or SPRING EASTER Board to SAVE for later! 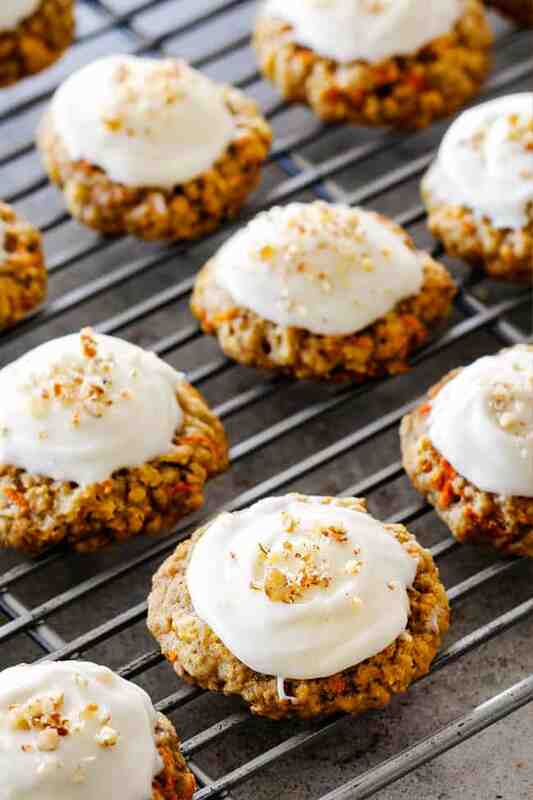 Soft and chewy Carrot Cake Cookies smothered in silky Cream Cheese Frosting for individual bites of carrot cake bliss! These Carrot Cake Cookies are perfectly portable, perfectly tender, and perfectly melt-in-your-mouth addicting. They encapsulate everything you love about Carrot Cake with its aromatic fragrant spices, carrots and pecans rolled into easy-to-make chewy cookie form. And of course, Carrot Cake wouldn’t be Carrot Cake without tangy, rich and luscious Cream Cheese Frosting! 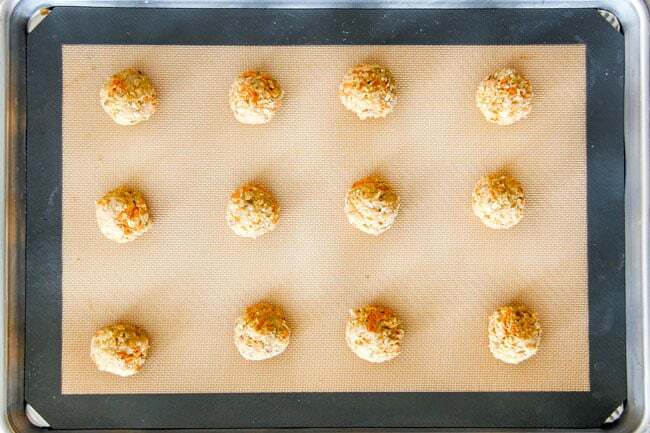 Preheat oven to 375 degrees F. Line a baking sheet with parchment paper or nonstick baking mat. Set aside. 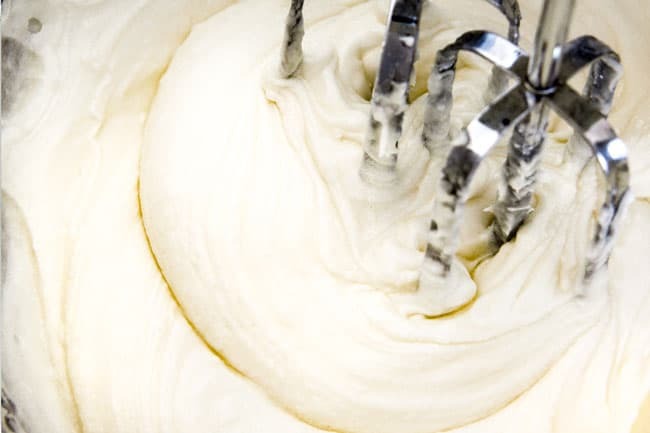 With a stand or handheld mixer, cream the butter and sugars together at medium speed until light and creamy. Add eggs one at a time and beat just until incorporated followed by vanilla, scraping down the sides as needed. Set aside. In a medium-sized bowl, whisk together the flour, baking soda, salt, cinnamon, nutmeg, ginger and cloves. With the mixer running on low, slowly add the dry ingredients to wet ingredients. The dough will be thick and you will have to finish mixing by hand. 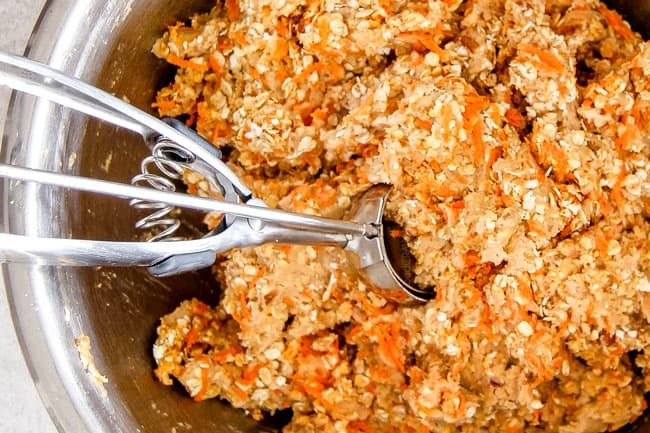 Stir in carrots, oats and pecans by hand just until incorporated – dough will be very thick. Scoop dough using a 1 1/2 inch/1 1/2 tablespoon scoop, roll into balls and drop 2” apart. Flatten the tops slightly. If you don't have a 1 1/2" cookie scoop, use what you have and adjust cooking time accordingly. Bake for 10-12 minutes, just until cookies are lightly golden around the edges (take care not to overcook or they won’t be as soft). Allow cookies to cool on cookie sheet for 3 minutes before transferring to a wire rack to cool completely before frosting. 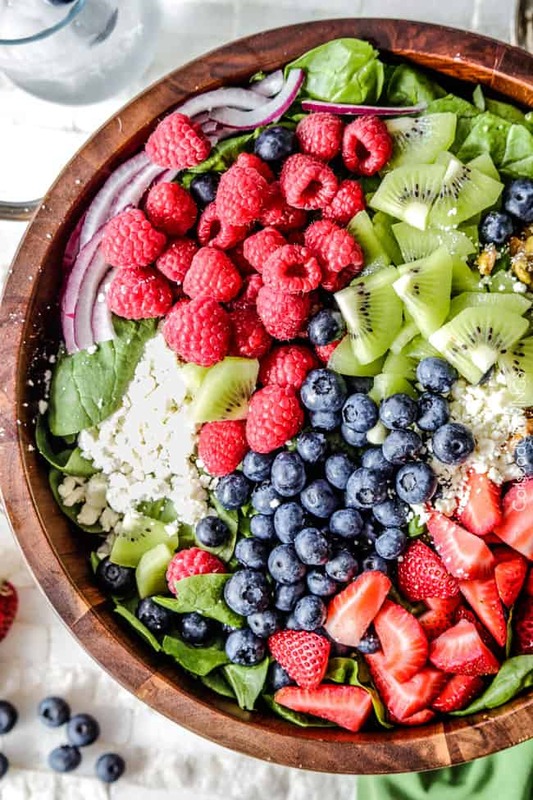 In a large bowl beat butter, cream cheese and vanilla until light and fluffy, 2-3 minutes, scraping down sides as needed. Beat in powdered sugar on low until combined then increase speed to medium-high and beat until thick and creamy, 1-2 minutes. Add milk, a tablespoon at a time to reach desired consistency. Frost cookies once completely cool and garnish with chopped pecans if desired. *Do NOT microwave butter or your cookies will be too soft and spread when baked. Let butter soften at room temperature until slightly softened. 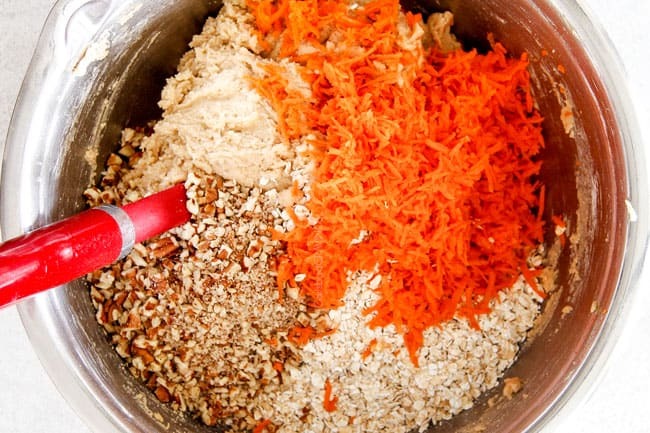 **Use only freshly grated carrots. Use the small holes on a box grater to grate the carrots. Do NOT use pre packaged matchstick carrots as they are too thick. ***Old-fashioned whole rolled oats will NOT work in this recipe, but if that’s what you have on hand, you can make your own quick oats by adding whole oats to food processor and pulsing 4-6 times or until they resemble the consistency of quick oats. ****Do NOT microwave butter or cream cheese to soften for frosting or it will be too runny. Let soften at room temperature. You can freeze frosted or unfrosted Carrot Cake Cookies. When ready to eat, remove desired amount of cookies from freezer bag then remove from plastic wrap so condensation doesn't form. These look amazing!! I can’t wait to make them this weekend!! Thank you so much Megan, I am excited for you to make them because I think you will LOVE them! I found your site last month and have been religiously cooking from it ever since! Everything I have made has been incredible- my family and I thank you!!! I had only tried your dinner recipes but finally tried a dessert – your Toffee Pecan Caramel Pound Cake- last Sunday and it was to die for. I am your new biggest fan and can’t wait to make these cookies next! Oh my goodness Shauna, thank you thank you for your amazing comment! I am humbled and honored you and your family are loving my recipes – that means the world to me. I love that Toffee Pecan Caramel Pound Cake too – great choice 🙂 I hope you love these cookies just as much and continue to find many new family favorites! These cookies are fantastic. I’m glad you included info on freezing extras. It’s only my husband and myself and I’m glad I can freeze some for later. Thanks for the great recipe. YAY! I’m so happy you made them already and are enjoying them! And you are so welcome for the freezing instructions! Hi Jessica, you can freeze them with or without the frosting. Enjoy! I made these today. My daughter in law likes carrot cake and I wanted to make these for her birthday…in the mean time EVERYONE else has loved them! I’m so happy everyone is loving these cookies Lisa, thank you! And please tell your daughter-in-law Happy Birthday from me! These cookies were amazing! husband liked them without the icing and everyone else gobbled the rest up! 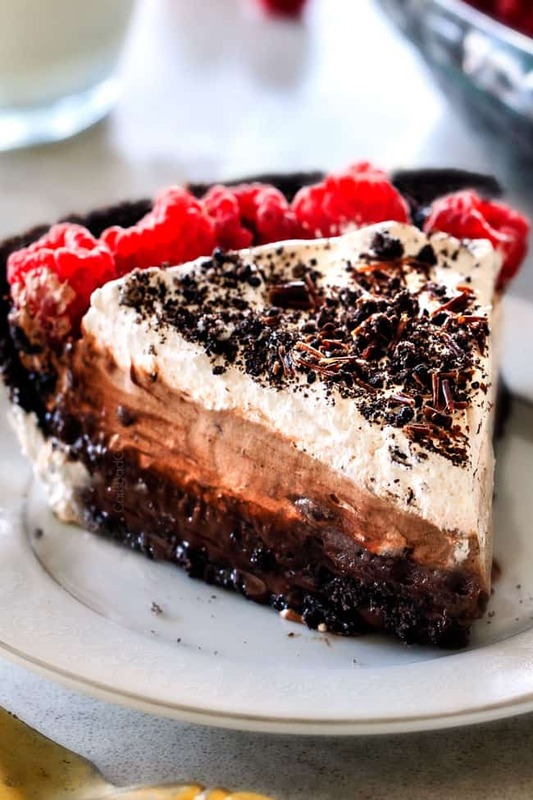 Love your recipes and always look forward to new ones in my in box. family can always tell when the dinner is one of yours! thanks so much for explaining so many things to me and showing me a way to finally make a tender pork loin!!!! What do you mean by slightly softened butter? I usually leave my butter out the night before I’m going to bake. Would that be too soft? Can you freeze the dough before baking? Thank you!